Scroll down to watch the step-by-step video. 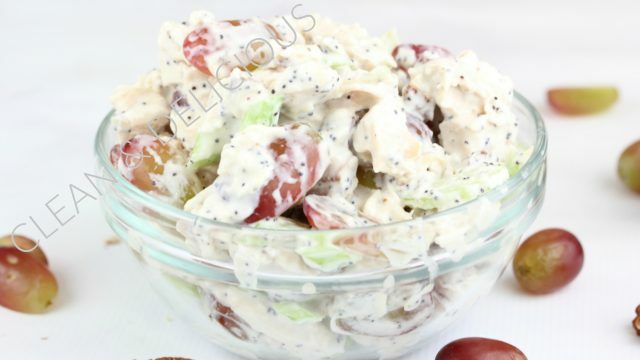 This version of chicken salad is the most popular chicken salad sold at Whole Foods to date. It has lots of flavor and texture and I just love how the poppy seeds add an extra surprise! I used Greek yogurt to create that cool and creamy dressing but you could certainly stick to the original and use real mayo OR if you can’t decide, do a 50/50 split. This salad is by far at it’s best when made with fresh baked chicken breasts but if you’re in a pinch, some store-bought rotisserie chicken will work just fine. Combine everything in a nice big bowl, stir well. Serve and enjoy! With the Sonoma chicken salad, am I able to do a meal prep with this or would it be better to have it freshly made everyday? You can definitely meal prep and keep it in the fridge for 3-5 days, but everything tastes better when its made fresh!! Omg , I’ve recently started eating healthy. But watching your healthy recipes have helped me out so much! Not to mention my children also love the new foods. I’ve already lost 5 pounds in less than a week. With all your help and of course my work outs. Thank you so much and keep up the with the videos! !! Is there a particular brand of apple cider vinegar you use for this? I used Braggs and feel like it’s overpowering the taste of everything. Love your videos! That’s the brand I use!